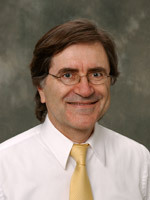 Dr. Serge Abrate is a Professor of Mechanical Engineering at Southern Illinois University Carbondale. Known for his publications dealing with impact on composite structures, his current research deals with underwater blasts, hull slamming, functionally graded materials, and metamaterials. His work has been supported by the Office of Naval Research, the National Science Foundation, the Army Research Office, and the Air Force Research Laboratory and industry. Dr. Abrate is a member of the editorial board of the International Journal of Mechanical Sciences, Composite Structures, and the Journal of Composites. Ph.D., Aeronautics and Astronautics (1983), Purdue University, West Lafayette, IN. M.S., Mechanical Engineering (1981), Purdue University, West Lafayette, IN. S. Abrate, Impact on composite structures. Cambridge university press, 1998. S. Abrate, Ed. Impact engineering of composite structures, vol. 526. Springer, 2011. S. Abrate, B. Castanie, and Y. Rajapakse, Eds. Dynamic Failure of Composite and Sandwich Structures, vol. 192. Springer, 2013. S. Abrate, “Interaction of Underwater Blasts and Submerged Structures,” in Dynamic Failure of Composite and Sandwich Structures, S. Abrate, B. Castanié, and Y. D. S. Rajapakse, Eds. Springer Netherlands, 2013, pp. 93–150. S. Abrate, “Effect of Explosions on Sandwich Structures,” in Dynamic Effects in Composites. D. Liu Ed. DEStech Publications, Inc., 2012. S. Abrate, Introduction to the mechanics of composite materials. In: S. Abrate, Ed. Impact engineering of composite structures, vol. 526. Springer, 2011. S. Abrate, Mechanics of Plates. In: S. Abrate, Ed. Impact engineering of composite structures, vol. 526. Springer, 2011. S. Abrate, Impact dynamics. In: S. Abrate, Ed. Impact engineering of composite structures, vol. 526. Springer, 2011. S. Abrate, Ballistic impacts on composite and sandwich structures. In: I. M. Daniel and E. E. Gdoutos, Eds. Major accomplishments in composite materials and sandwich structures. Springer, 2009. S. Abrate, “Machining of composite materials,” Composites Engineering Handbook (A 98-11526 01-24), New York, Marcel Dekker, Inc.) Materials Engineering, vol. 11, pp. 777–810, 1997. S. Abrate, “Design for impact resistance,” MECHANICAL ENGINEERING-NEW YORK AND BASEL-MARCEL DEKKER-, pp. 209–209, 1995. S. Abrate, “Hull Slamming,” Appl. Mech. Rev., vol. 64, no. 6, Nov. 2011. R. Panciroli, S. Abrate, and G. Minak, “Dynamic response of flexible wedges entering the water,” Composite Structures, vol. 99, pp. 163–171, May 2013. R. Panciroli, S. Abrate, G. Minak, and A. Zucchelli, “Hydroelasticity in water-entry problems: Comparison between experimental and SPH results,” Composite Structures, vol. 94, no. 2, pp. 532–539, Jan. 2012. S. Abrate, “Free vibration, buckling, and static deflections of functionally graded plates,” Composites Science and Technology, vol. 66, no. 14, pp. 2383–2394, Nov. 2006. S. Abrate, “Functionally graded plates behave like homogeneous plates,” Composites Part B-Engineering, vol. 39, no. 1, pp. 151–158, 2008.